It’s the most wonderful time of the year, and even some flavor trends extend well beyond it. Take, for instance, the popularity of peppermint, which has long been associated with, and often peaks during, the holiday season but is now becoming a perennially favorite flavor. Compared to pumpkin spice, which kicks off autumn before Labor Day, but generally falls off once the New Year rolls around, peppermint has a lingering effect on consumer cravings. According to the recent Flavor Consumer Trend Report by Chicago-based Technomic Inc., flavors previously linked to the holidays – namely, peppermint and cinnamon — are starting to stay on the menu in independent and fine dining chains. In another recently-released study, Technomic found that the use of mint in non-alcoholic beverages jumped 30.4 percent and that the use of add-ins has risen 6.7 percent over the last two years. The type and use of mint beverages has evolved with and through the seasons as well. In its Seasons Eatings Report for winter 2016, Technomic trend spotters project that in the run-up to the New Year and through the winter, specific mint flavor profiles like peppermint and spearmint will be in demand. Already, the marketplace reflects the refresh, so to speak, of minty flavor profiles. An early glimpse at holiday beverage menus shows a move toward more festive green and minty drinks. Meanwhile, in the dessert and ice cream category, Mintel Group Ltd. reports that at least 16 new products featuring peppermint have been launched in the U.S. marketplace, including unique items like Cado Organic Mint Chocolate Chip Avocado Frozen Desserts as well as a new take on a classic, the Good Humor Girl Scouts Thin Mints Frozen Chocolate Mint Dessert Bar. As operators meet their customers’ penchant for mint flavors, KPFG’s own trend spotters and product development experts have been ahead of the curve. The company’s new peppermint flavor packet is a relevant and easy addition to soft serve mixes, used during and beyond the holiday season. Simply blended with Frostline vanilla soft serve, the peppermint flavor packet allows operators to offer a mint variety of soft serve for a limited time. With only weeks away, now is the time to add the refreshing taste of peppermint to your menu. Please visit Frostline’s website, www.frostlinefrozentreats.com, to find your nearest broker or fill out the contact form. Whether for a candy cane-blended treat, a cone that evokes the spirit of the season or, later in the year, a refreshing alternative to everyday flavors, the addition of mint can lend some cheer to favorite cold desserts. ‘Tis the season – make that the year – to be jolly about mixing up menu offerings. *Source: Season’s Eatings Report: Winter 2016, Technomic Inc.
Let’s face it…customers love delicious soft serve choices but having just one soft serve machine can limit your creativity. STOP! That’s a myth. The truth is that there is a simple way to flavor traditional vanilla and chocolate soft serve to drive repeat business. Operators can easily and affordably achieve specialty flavors by mixing in a Flavor Packet from Frostline®. Imagine offering Vanilla and Strawberry Shortcake or Vanilla and Chocolate Mint. Now think of it as a “swirl” of flavor. Flavor packets transform soft serve into a valuable commodity: more customer choices with very little prep time. How easy is it to use flavor packets? Really easy. Transform vanilla or chocolate soft serve and frozen yogurt into specialty dessert flavors. Operators often feature a flavor-of-the-day or weekly LTO (limited time offer). This is a wonderful way to draw more traffic to restaurants and independent shops; only make sure to shout it to the rooftops. Promoting new flavors on social media platforms can pique interests and motivate patrons to visit sooner than later. Another helpful hint is to request that customers “check in” on Facebook and share pictures on Twitter, Facebook, Instagram and/or Tumblr. This a fun way to promote your operation and encourage guests to visit. Holidays and events become even more promotable when seasonal themes are incorporated. Making new twists on traditional ideas such as “Eggnog in July” or “Orange October” can get customers thinking about soft serve more often; translating into higher sales. Winter months are a great time to feature specialty flavors like Peppermint, Gingerbread, and Pumpkin. Another benefit to using Flavor Packets is that operators can plan promotions in advance with the peace of mind that the flavor is immediately accessible on the shelf. Like our soft serve mix, Flavor Packets are a dry mix. They store flat on storage shelves and have a one year shelf life. If a flavor interests you, please leave us a comment and we’ll gladly send you a sample. If you are ready to purchase a case, please visit our online store http://www.precisionfoodsstore.com/flavor-packets.html or talk to your nearest foodservice broker. With Frostline®, preparation is simple – just 4 easy steps – fill, stir, mix and pour. Operators love serving Frostline because it is delicious and profitable! Step 1 – Fill a clean, complimentary Frostline mixing bucket to the indicated red line with cold tap water. If using a Frostline Flavor Packet, add contents of packet and stir until dissolved. Step 2 – Add entire contents of Frostline dry soft serve or frozen yogurt mix to the mixing bucket and stir with a wire whisk creating a vortex. Step 3 – Continuing stirring the mixture, making sure to keep the vortex going, and stopped when thoroughly mixed (about 2 minutes). Step 4 – Pour the mixture into your commercial soft serve machine (Frostline works in ALL commercial soft serve machines) or cover and place in the refrigerator for up to 48 hours. FDA requires product temperature to reduce to 41°F within 4 hours and to remain at or below 41°F. Once your mix is inside of the hopper, you should have The Perfect Frozen Treat™ in about 10 minutes (please refer to your machine’s owner’s manual for exact freezing times)! The liquid yield for each mix is 2.5 gallons per bag or 15 gallons per case. Frostline estimates you get about 113 – ½ cup prepared servings per bag and about 678 servings per case If you have any questions or want to place an order, please call us at 1-800-442-5242. Please check out our newest mixing video on YouTube to see Frostline in ACTION! Introducing Birthday Cake Soft Serve! A Celebration of Flavor and Color! Excuses, excuses! No more excuses not to eat birthday cake! We recently perfected our newest soft serve flavor Birthday Cake and it is BLUE! You might ask why we choose this flavor and color combination over a billion other combinations? The answer is simple – we think it’s time for a celebration! Cone or dish? Celebrate flavor with our newest flavor packet – Birthday Cake! Kids perusing an ice cream parlor are drawn to a selection that makes a statement with a bold color and a crazy fun name. We’ve all been there…red, blue, orange, black, purple, hot pink; they exude fun AND hold the possibility of a color-stained tongue. Don’t believe us? Tom Kerber Jr. of Kerber’s Dairy in Pennsylvania said, “Most kids…they don’t care what flavor the ice cream is…they care what color!” He added, “…Anything that sounds really goofy or fun, they like that!” reported the Pittsburgh Post-Gazette. Bright colors and creative names don’t just attract kids but they are proven to attract the young at heart too. According to Food Business News in May, manufacturers are “keying in on childhood classics, with s’mores, peanut butter and jelly, and birthday cake among featured flavors in new products.” Birthday cake’s popularity resulted in the introduction of birthday cake-flavored M&M’s, Oreos, vodka, and America’s favorite Easter chicks – Peeps. There is no denying that color attracts but when it’s in a soft serve machine, flavor variations are equally as important. Plus, let’s face it, there is a seasonality to soft serve, and a good survival tactic in the off-season is offering trendy flavors. In response to the “featured flavor” trend, we created flavor packets that can be purchased in packs of 12 and 36 and yield 113 servings per packet. Favorites for fall include, Pumpkin, Kettle Corn and Dulce de Leche. Once the winter holidays set in, Peppermint, Egg Nog and Gingerbread are safe bets and when spring arrives, Matcha Green Tea, Banana Split and Chocolate Lovers fit the bill. At the height of soft serve season, adding flavors such as Valencia Orange, Strawberry Shortcake and Sun-Ripened Raspberry can be a refreshing change. Check out our complete list here. 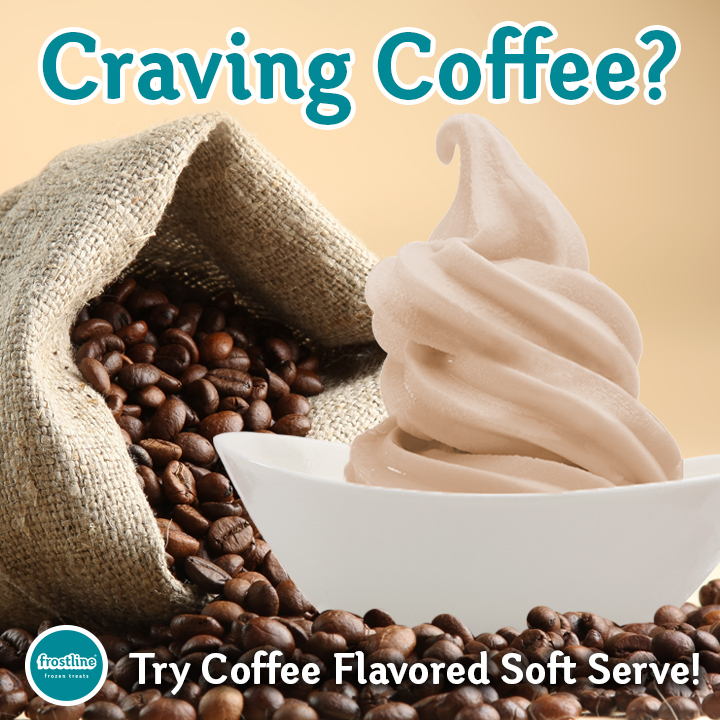 Give them a “cup of joe” in the form of soft serve. Although, flavor packets make implementing seasonal flavors quick and easy, Frostline has many recipes for creating your own unique soft serve just by adding one additional ingredient to our soft serve mix. For example, soda varieties like Mountain Dew, Cherry Coke or Dr. Pepper create a taste-tempting teenage delight and for younger kids, adding grape juice or apple cider lures them in! For adults, black coffee easily transforms into “a cone of joe” or a local microbrew will spike up a hopper quickly and tastefully! Want to try our newest flavor – Birthday Cake? Please leave us a comment on this blog and we will send you a sample. All you need is a soft serve machine and vanilla soft serve mix! The flavor packet is easily added while mixing the soft serve mix with water. Check out our newest mixing video! Celebrate EVERYDAY with Frostline! For pennies per serving, you can attract families to dine at your restaurant or soft serve shop and keep coming back for more! Especially if you rotate seasonal flavors in between your gold standard vanilla and chocolate! The dreaded drip n’ slip, broken ice cream scoops, arm and wrist scoopers’ pain, tension from ice cream balls falling off of the cone, deep dip hip discomfort from leaning into the freezer, and the awful cross contamination of ice cream scoops being dipped in different flavors. The dangers of hard-packed ice cream are evident. We say “Put Down the Scoop” and save people from ice cream related accidents! 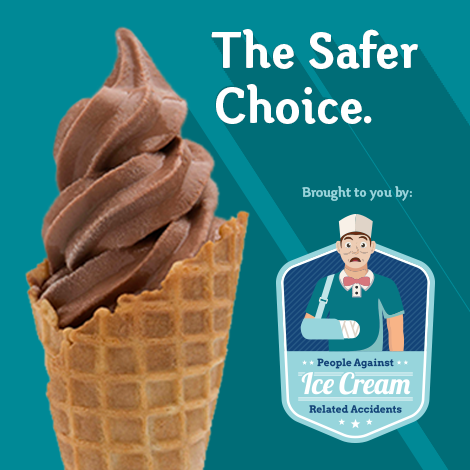 This is why we are working with “People Against Ice Cream Related Accidents (PAICRA) to promote soft serve ice cream – the safer frozen treat! Soft Serve is the safer choice! Put Down The Scoop! In all seriousness, Frostline® Frozen Treats, is celebrating National Soft Serve Day, August 19. We invite operators to join us in a little fun centered on the benefits of serving soft serve ice cream over traditional hard packed ice cream. We created PAICRA, a fictional organization, to shine a light on scoop-related injuries and misfortunes. Utilizing social media, we plan to showcase humorous mishaps that often occur when scooping hard packed ice cream as well as encourage soft serve vendors to share stories or images with us and their followers. Other fun ways to celebrate National Soft Serve Day include hosting tallest swirl contests, offering discounts on soft serve, or highlighting new, unique flavor varieties. 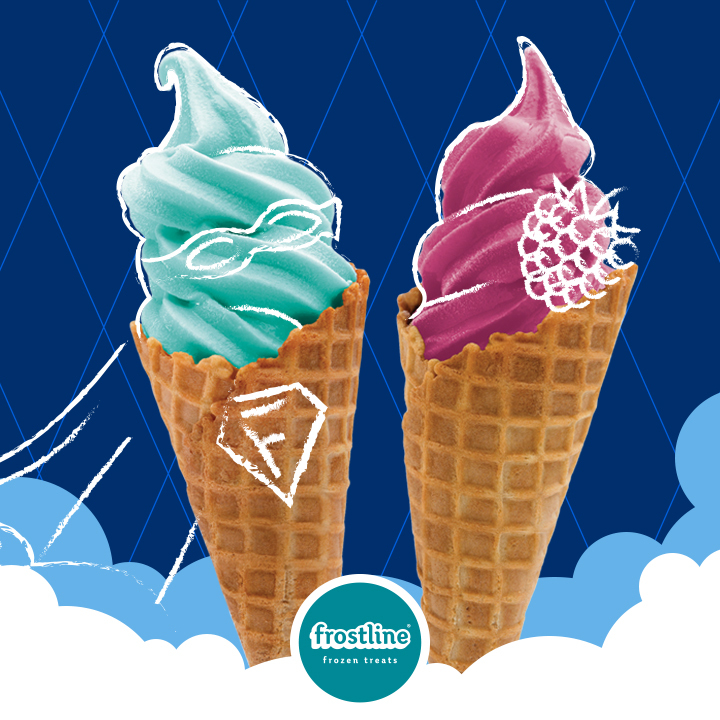 Restaurants, frozen yogurt shops and other businesses who offer soft serve ice cream are encouraged by Frostline® to participate in the August 19 national holiday. We have limited supplies of t-shirts, posters, and product samples to support your efforts. Please leave us a comment on this blog and we will be in touch! Second, let’s translate that into real-world application. The “perfect” taste, texture and feel (a.k.a. creamy and yummy) are the goals at Frostline®.Quality ingredients are the key to the “Essential 3” mentioned above. Our product line offers soft serve mixes, frozen yogurt mixes, frozen beverages (including smoothie base mix) and flavor packets. Five stars is the only acceptable quality rating we want to achieve from consumers! Customer satisfaction weighs heavily on their “perception of healthy”. Frostline® is peanut and tree nut free, lactose and gluten free, low in fat and calories and it contains 0g of trans fat. We assure that our processing facilities are clean with no cross contamination and our employees follow strict safety and quality ISO standards. The consumer is always right, however, we want operators to rank our “perfection” too! That’s why we are proud of our shelf life (12 months), simple mixing instructions (add water to the complementary mixing bucket, stir and pour) and our free, marketing resources available to our clients. If a business owns a commercial soft serve machine or blender, they can sell The Perfect Frozen Treat™. If you answered a, b, c, d or e, you’ve come to the right place! Kent Precision Foods Group offers a soft serve mix that will meet your needs. Let’s begin with your machine or machine: ElectroFreeze, SaniServ, Stoelting, or Taylor? No problem. 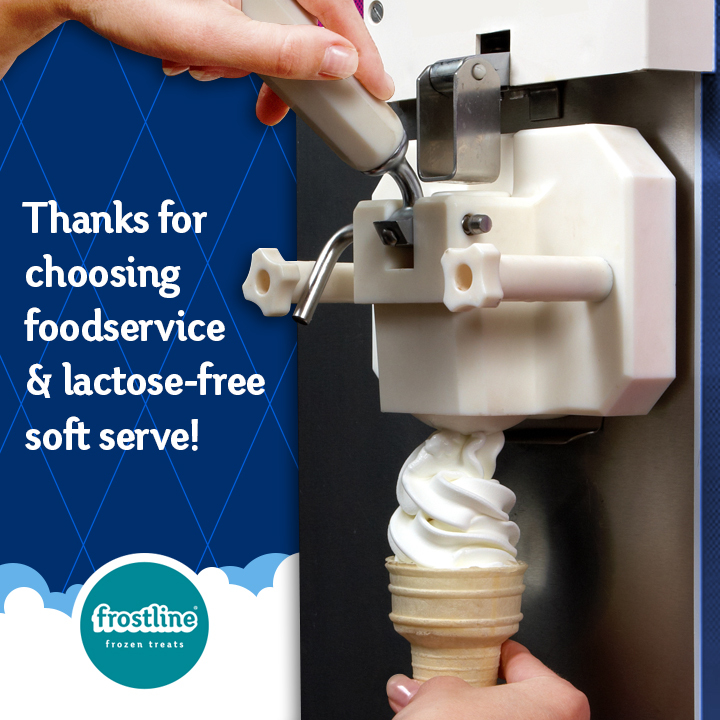 In fact, Frostline® and DOLE® Soft Serve work in all commercial soft serve machines. Why Frostline®? Why DOLE® Soft Serve? 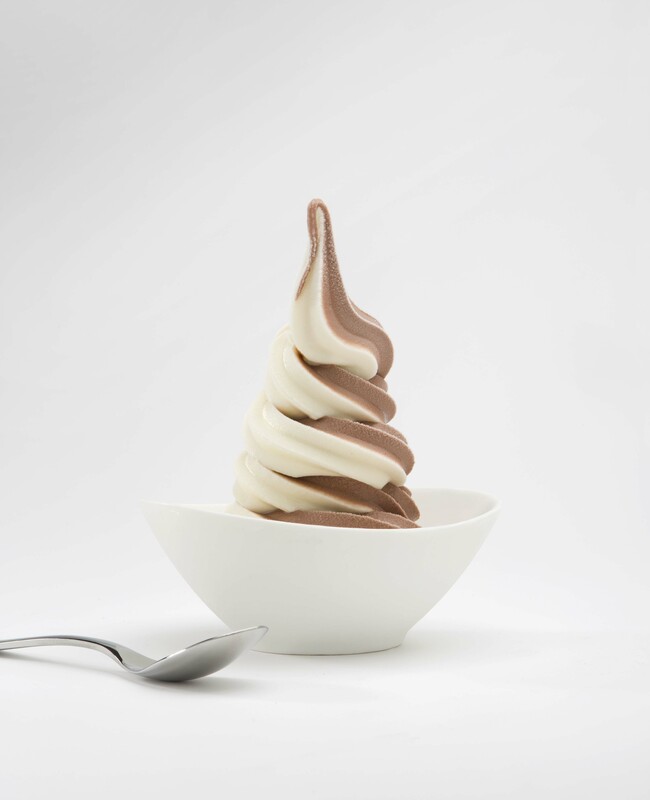 The biggest distinguisher between the two brands is Frostline® is a smart choice for businesses looking to offer basic but appetizing soft serve flavors: Vanilla, Chocolate and Swirl. It is a cost effective frozen dessert that tastes great! In addition, if you have multiple machines or would like to offer fun, seasonal flavors, Frostline® offers flavor packets that can expand your menu 17 or more times. DOLE® Soft Serve is the perfect choice for businesses with multiple soft serve machines or businesses located in a community that demands a nutritional “niche”. DOLE® Soft Serve fruit flavors are vegan friendly, dairy free, fat free, cholesterol free, gluten free, lactose free, and made with natural colors. 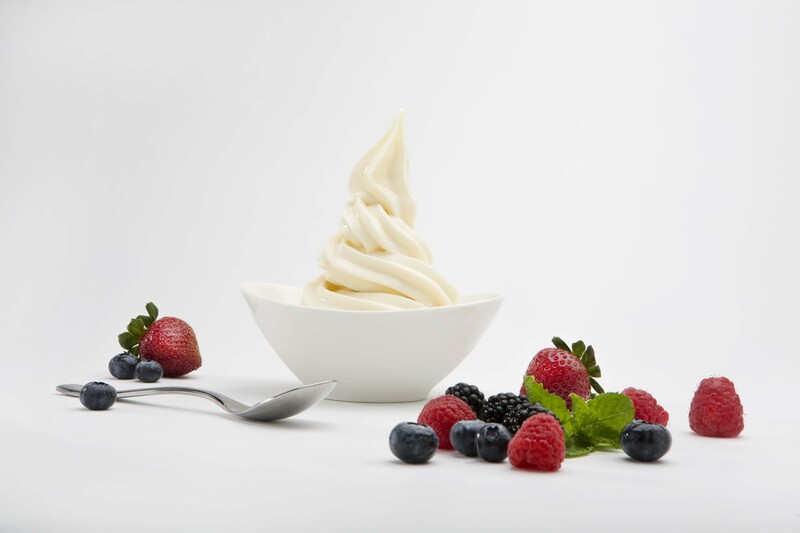 Offering five fruit flavors, as well as Vanilla and Chocolate, easily provides an attractive, solid, palate-pleasing menu for soft serve businesses. Kent Precision Foods Group has had the pleasure of partnering with DOLE®, one of the most recognized and trusted brands in real fruit flavor, for over 17 years. Confidence is KEY! How can you be confident your patrons will keep coming back for more? TASTE! It would be unthinkable for us to offer anything less than delicious! Recent Technomic research states 94% of operators say taste is the main criteria when selecting a soft serve brand. Both Frostline® and DOLE® Soft Serve offer a sampling program. Please contact your foodservice broker or contact us for more details. Why dry? Both Frostline® and DOLE® Soft Serve are packaged dry for many reasons. First, the largest benefit is cost. The only difference between dry mix and liquid mix is WATER. Adding water to the product before shipping passes along unnecessary costs to you in product and shipping. It also forces the manufacturer to add preservatives, which is a hot topic (Hood, 2014) in today’s news. Moreover, purchasing dry mix eliminates the worry about ordering too much or too little product because of expiration, refrigerated storage capacity and waste. We simplify the mixing process with complementary mixing buckets and whisks, mixing videos, and easy to follow instruction sheets. Plus we always support our customers with recipes, posters, flavor strips and an array of other marketing materials. Frostline® Simply Smoothies™ and Frozen Beverages expand frozen dessert menus beyond the traditional cup and cone (although we LOVE being served in waffle cones, especially chocolate dipped with sprinkles). 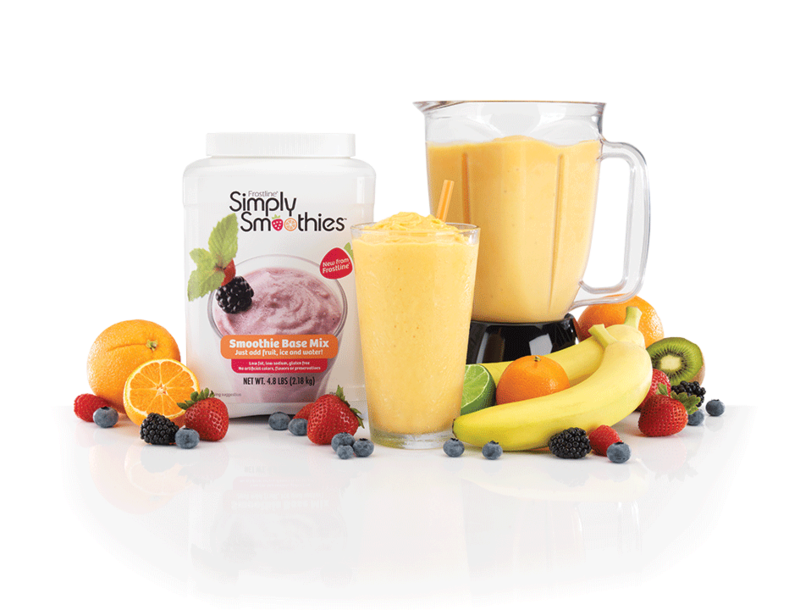 Simply Smoothies™ is a NEW, uncomplicated, dry-mix base product available in 4.8lb re-sealable containers or single serve packets. Just blending with water, ice and ingredients such as frozen fruit, vegetables, cookies or even alcohol, allows operators to target new customers desiring an on-the-go snack sipped through a straw! Finally, don’t stop there! Offering trendy Frostline® Vanilla and Mocha Iced Cappuccinos or Shakes can effortlessly and DELICOUSLY round-out any frozen dessert menu.